The following is a paper submitted to Dr. Kevin Vanhoozer in partial fulfillment of the requirements for the course ST 7505 Use of Scripture and Theology at Trinity Evangelical Divinity School in December 2015 in Deerfield, Illinois. The full title of the paper is The Use of Scripture in Evangelical Political Proposals – A Case Study: Comparing, Contrasting, and Analyzing Jim Wallis and Wayne Grudem’s Use Of Scripture to Authorize Their Distinct Approaches to Economics. Note: I’m not the proudest of this paper. Due to time restraints I was forced to write it in the timespan of merely two days. Nonetheless, I share it in case anyone may benefit from it by its prompting critical reflection. I only ask they you read with an extra dose of grace on this one. Thank you. “Our guys won!” Those were the words of one of my fellow church members after Republican candidates largely swept their Democrat counterparts in the 2014 midterm elections. A neither small nor insignificant assumption was present in her statement: the Republican candidates were the evangelicals’ candidates; a victory for the Republicans meant a victory for Christendom. Such a wedding of the religious right with the political right is not uncommon in the American evangelical consciousness, and, by extension, the perception of the popular culture at large. For example, if one listens consistently enough to Albert Mohler’s daily broadcast The Briefing, one will be repeatedly “informed” that the ultimate difference between the political right and political left is one of worldview: progressive policies are spawned out of what is an unqualifiedly non-Christian worldview (either that or political liberalism is equated with theological liberalism) while political conservatism is described in such terms (and without nuance) so as to lead one to believe it is essentially a Christian (evangelical) worldview gone political. Carl Trueman points out in his witty, provocative, and deeply well-informed way [that] the alliance of conservative Christianity with conservative (neoliberal) politics is a circumstance of our own context in U.S. politics—neither historically nor logically necessary. The combinations of issues [i.e., the bundling up of certain political issues as “conservative” and others as “liberal” and binding evangelicalism to the former] seem to make sense in America, but they don’t make sense to many people elsewhere in the world. . . .
[T]he political spectrum in the United Kingdom, and indeed in Europe, is quite different from the spectrum in the United States. In Britain, issues are bundled up in different ways than in America. What’s more, over the last forty years, those in the United Kingdom who have tried to integrate faith and public life have mostly been on the left of the spectrum, while those who have done the same in the United States have tended to be on the right. “The British are coming! The British are coming!” and they are challenging our American political-religious bundlings in the process. The following is minor paper completed in partial fulfillment of the requirements for the course ST 7505 Use of Scripture and Theology taught by Dr. Kevin Vanhoozer at Trinity Evangelical Divinity School in Deerfield, IL in December, 2015. Please note that the focus of this paper (and the class) is not hermeneutics, but the use of scripture in making dogmatic and moral theological proposals. One’s use of scripture for dogmatic and moral theology must be in keeping with the nature (ontology) and purpose (teleology) of scripture itself. If one’s use of scripture to authorize theological proposals is actually going to authorize those proposals with the authority of scripture itself (a derivative authority), one’s use must be born out of the very claims—which, one must remember, are communicated in a variety of ways through a variety of discourse forms—of scripture itself (the locus of authority). Consequently, one’s appropriation of scripture for dogmatic and moral theological proposals must be based on the purpose, intent, or underlying reasoning of Biblical content, not its accidental, attendant, or purely descriptive features. The following is taken and modified from a outline on Gregory of Nyssa’s Life of Moses I will be presenting for a class. 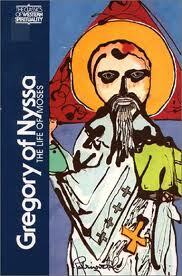 In this work, Gregory of Nyssa presents a spiritual-moral-contemplative-allegorical interpretation of Moses’ life with the theme of virtue as its driving paradigm for his interpretive ‘insights.’ To say the least, most of his interpretations are rather outlandish. His goal is that “by transferring to your own life what is contemplated through spiritual interpretation of things spoken literally” (II.320) “those who have been striving toward virtue may find aid in living the virtuous life” (II.49, 148). Allegorical interpretation of literature is legitimate if the literature is meant to be interpreted allegorically (e.g., Pilgrim’s Progress). The Pentateuch is not such literature. At the very end of his book, On the Incarnation, Athanasius makes a very interesting comment that has always stuck out to me. But for the searching and right understanding of the Scriptures there is need of a good life and a pure soul, and for Christian virtue to guide the mind to grasp, so far as human nature can, the truth concerning God the Word. One cannot possibly understand the teaching of the saints unless one has a pure mind and is trying to imitate their life. Anyone who wants to look at sunlight naturally wipes his eye clear first, in order to make, at any rate, some approximation to the purity of that on which he looks; and a person wishing to see a city or country goes to the place in order to do so. Similarly, anyone who wishes to understand the mind of the sacred writers must first cleanse his own life, and approach the saints by copying their deeds. Thus united to them in the fellowship of life, he will both understand the things revealed to them by God…. ~ Athanasius, On the Incarnation, chapter 9, section 57. The following is from an excursus entitled “The Use of Hosea 11:1 in Matthew 2:15” by Duane Garrett. He makes some helpful observations that are too often overlooked in much contemporary discussion regarding Biblical prophecy. To put it more pointedly, did Hosea suppose that this verse looked ahead to the Messiah? It is, of course, difficult if not impossible to show that Hosea intended readers to discern from this passage that the Messiah would come out of Egypt. This question, however, is the wrong question to ask of Hos 11:1. The real issue is not, Did Hosea intend this verse to be read messianically? but What did Hosea understand to be the nature of prophecy? In answer to this question, we must assert that Hosea, like all biblical prophets, saw prophecy not so much as the making of specific, individual predictions (which are actually quite rare among the writing prophets), but as the application of the Word of God to historical situations. In doing this the prophets brought to light certain patterns that occur repeatedly in the relationship between God and his people [typologies]. These patterns or themes have repeated fulfillments or manifestations until the arrival of the final, absolute fulfillment. Thus, for example, the conquest of the land “fulfilled” the promises to the patriarchs but did not fulfill those promises finally or in their ultimate form. The inheritance of the “new earth” is the ultimate conclusion of this prophetic theme. All of the prophets were, to some degree, “like Moses” (Deut 18:5), but the ultimate prophet like Moses can only be the Messiah. Each of the kings of the line of David was a fulfillment of the promise that God would build him a “house” (2 Sam 7), but the Messiah is again the final fulfillment of this theme. Thus prophecy gives us not so much specific predictions but types or patterns by which God works in the world. We need look no further than Hosea 11 to understand that Hosea, too, believed that God followed patterns in working with his people. Here the slavery in Egypt is the pattern for a second period of enslavement in an alien land (v. 5), and the exodus from Egypt is the type for a new exodus (vv. 10–11). Duane A. Garrett. Hosea, Joel. The New American Commentary. Vol. 19A. Nashville: Broadman & Holman Publishers, 1997, 221-22. We often think of Biblical prophecy as essentially predictions of the future. But is that accurate? It would be better to understand most of Biblical prophecy as actually the application of the past to the present and future. We might think of it like this–God’s past acts serve as models, paradigms, or types for His future dealings.